As the expiration date for her Bloomspot deal was nearing (she paid $25 for $50 to spend on food & drink), my friend 'Designer' was kind enough to bring me as her guest to check out Eva Restaurant. I loved the place immediately - it was in what looked like a converted bungalow, and exuded sophisticated charm from every angle. There were a handful of tables inside, with the best one straight in front of the window with a view into the kitchen, as well as a few tables along the covered wraparound deck. It had a chic design (in cool grey and black), but was cozy - a combination that I love. We kicked off our meal with a round of cocktails - our lovely server was super knowledgeable about pretty much everything on the menu, and though my preferred liquor usually come in whites, he patiently made recommendations from the cocktail list - which is focused on amber liquors (as these have more flavor). 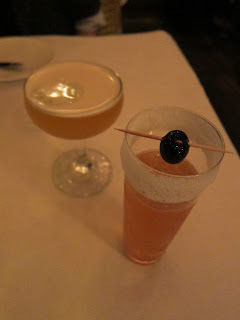 Seems like a lot of people have been raving about fernet, and I've never tried it - so I went with the Self-Preservation Society ($12) with cocchi americano fernet, dry gin/lemon/ maraschino/bitters/sugar crust. The drink had a carefully controlled intensity - equally sweet and bitter, with a bit of citrus to cut through both. It also came with a great sugar rim and a dark maraschino cherry on a stick. I normally don't take pics of the free bread basket, but the bread here was really good - tasted fresh out of the oven. As a starter, I had one of the best 'simple' egg dishes I've ever had: Schaner Farm's Organic Chicken Egg ($13) toasted cauliflower, mustard sabayon - a perfectly cooked (63 degree?) poached egg sat atop cauliflower that tasted and looked like bacon bits, with a light - almost imperceptible - kick from mustard sabayon. The egg was liquid gold - I love a good runny egg like I love oysters - both such pure foods, untouched inside, beautiful by nature. And I love breakfast foods for dinner - so this one was perfect for me. 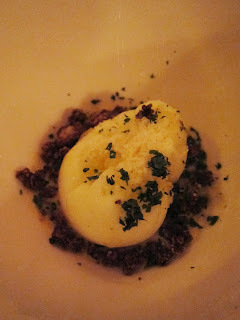 Also loved that this dish made me see cauliflower in a whole different light. 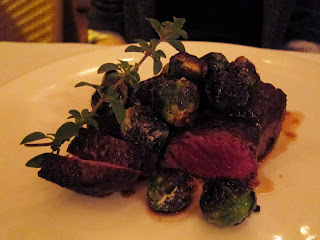 Designer got a "Prime" NY Steak ($36) with potato emulsion / roasted carrots - cooked medium rare, of course. Tender, juicy and flavorful - worth every dollar. 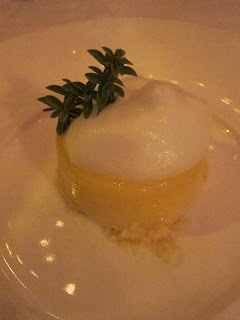 And the potato emulsion was creamy, velvety and divine. For my main, I went for the Domestic Squab, New York ($38) with "warren" pear/ turnip/ chanterelle - loved the presentation on this one, the baby turnips were adorable! 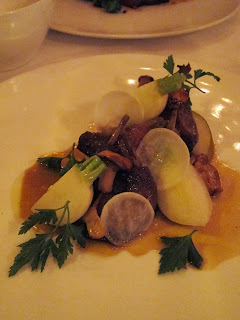 A rustic but beautifully presented dish - that was also delicious, with the bite-sized pieces of tender, juicy, gamey bird counterbalanced by the subtle sweetness of pear slices, earthiness of chanterelle mushrooms, and crunch of turnip. Loved this. Stuffed after the previous plates, we shared a dessert: Steamed Lemon Souffle Cake ($9) with thyme foam - I would have liked this to be a little less sour, but the lightness of the cake and foam and refreshing citrus with hint of herb was perfect after the substantial proteins. After taking off the $50 from the Bloomspot deal, PLUS $20 OpenTable gift certificate (both courtesy of Designer!) and 30% off from making the reservation through Savored - we hardly had to pay anything at all! 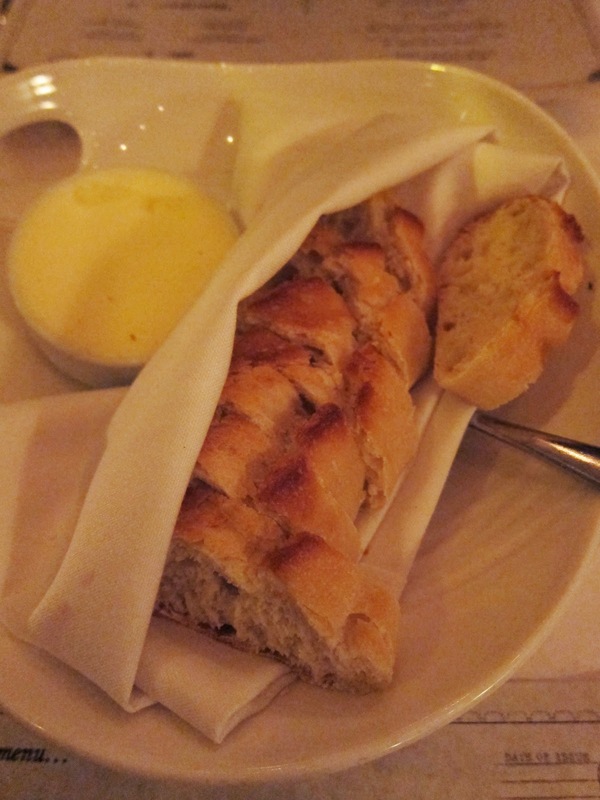 But of course we tipped on the pre-discounted amount - our server was simply fantastic. He told us about the Wednesday AYCE fried chicken dinner (but it was only that week before the holidays - call for other specials) and Sunday Family Style Suppers, where you not only get 4-5 courses for $39 per person - you also get bottomless house wine with your meal! Without the group buy deals these would be the best options for foodies on a budget. All in all, a great meal in a lovely spot that feels like home - if home came with an executive chef who blew your mind, plate after plate. Will definitely find our way back to Eva soon!! !